A lot of us have kids that are going back to school really soon. Some of us are in denial that there will be homework, the dreaded school parking lot and Kindergartners going off to school for the first time. Others can’t wait until that bittersweet first day when they drop their kids off at school and dance the whole way home. 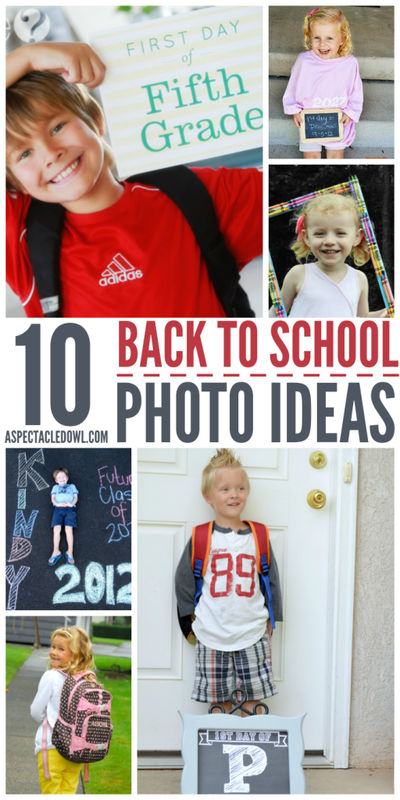 No matter how you’re feeling about heading back to school, it’ll be here before you know it and you can start planning now for those first day of school pictures with these 10 Back to School Photo Ideas. Printable grade signs are easy props for memorable first day of school photos. Doodle your child’s grade number and the school year on a chalkboard and have your child hold it up on the first day. This classic always goes over well. A crayon frame is an excellent prop for preschoolers and kindergartners. What does your child want to be when he or she grows up? Ask them, write it on a dry erase board, and include it in the picture. What a sweet memory! No time to doodle on a chalkboard? A chalkboard printable is just as cute. If you homeschool, pose your kids in front of a large chalkboard or dry erase board. Coordinating shirts are a plus! Have a child starting preschool? Have him or her pose in a graduation year t-shirt. Record your child’s special day in sidewalk chalk with your kiddo lying down beside your doodle. Snap a picture of your kid with his or her new backpack! Take your child’s picture in the same outfit on the first day and last day of school to see just how much your little one has grown.